In facticles, this time things are going to be harder, even without the 16.66% (recurring) more challenge. It’s January (last time it was June). I now have a full-time job with an hour-long commute (last time I was footloose and fancy free). This time my pain cave is a slightly damp garage (versus a sunny conservatory at our rented gaff). This will be a much truer test of whether someone with low-to-middling cyclo-motivation (right now), a young family, work commitments and a few stored Christmas calories can implement a (sort of) cycling fitness plan, and get back on the (broom)wagon. As before, my objective is simple. All I have to do each day is get on a bike and ride for 15 minutes. 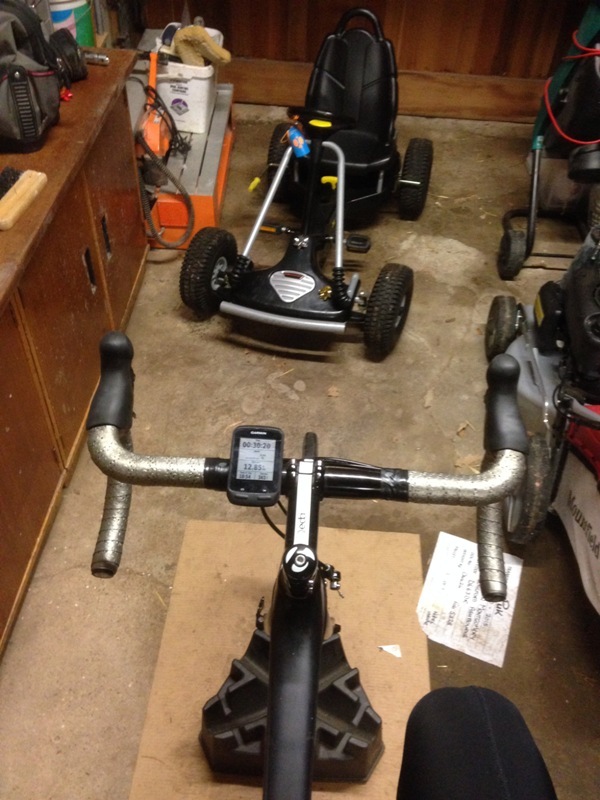 Any bike ride, be it outside or inside on the turbo, that lasts for a minimum of 15 minutes constitutes a success. I admit, it’s a bit of a strange expression (and has nothing to do with nuns). However, as long-time readers may recall, I am persuaded by the habit-science (my term) summarised in the book ‘The Power of Habit: Why We Do What We Do, and How to Change’ by Charles Duhigg*, and specifically the practical use of so-called ‘keystone habits’. Keystone habits are small, seemingly insignificant repeated behaviours which, over time, can build into much larger lifestyle changes. 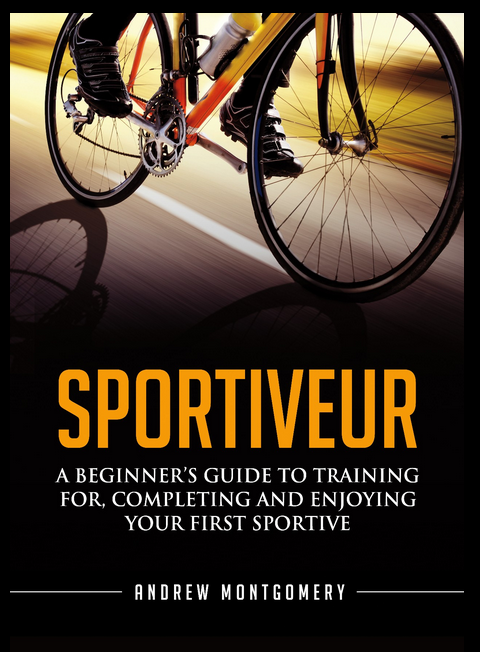 To put it in Sportive Cyclist terms, my 35 days of (at least) 15 minutes of cycling on an indoor trainer are going to translate into epic sportive success later in the year. (Or, come 1st February 2016, I’ll at least be somewhat better off, cycling fitness wise, than had I sat on my aris for 35 days straight). * Incidentally, (affiliate) links to the book, if you’d like to buy it, are here: Amazon UK or Amazon.com . Those aforementioned long-time readers may also remember from my four-part series on how to lose weight get lean for performance (the first of the four parts being available here) the importance of weighing yourself regularly if you’re looking to reduce those winter fat stores. Whilst there are many varied dietary strategies employed by successful weight losers (i.e those that get lean and subsequently stay lean), one of the most frequently-exhibited behaviours amongst the get-lean brigade is the undertaking of frequent weigh-ins. So, in Sportive Cyclist terms again, this means that whilst later today I am planning to consume Beef Wellington with lashings and lashings of red wine, tomorrow I will weigh myself and determine that I shouldn’t be eating quite as much pastry-wrapped cow in the future. A quick squiz at my Fitbit account (which automatically updates with my weight and body fat percentage each time I use my funky Fitbit Aria Wifi scale ) tells me that I currently tip the balance at 67.2kg / 14.6% fat. To be honest I was expecting worse than this. I consider Wednesday 10 June 2015 to be my ‘fittest day ever’. It was the day before I started back at work. It marked the end of a long block of reasonable quality cycling training (for me). I won the dad’s race at my son’s school sports day (not on a bike). According to Fitbit, my vitals on that day were 65.1kg weight and 14.4% body fat. It’s safe to say that my fitness has not stayed so relatively stable. I’ll attempt to weigh in every day, in a bid to stay conscious of my weight, and thus what I eat, but I won’t be deliberately attempting to make specific changes to my diet. There’s only so many new habits you can lock in at any one time. I’m not too focused on an end goal as such. The goal is to complete the challenge. Assuming things stay on track, I’ll think about the next stage of my 2016 cycling journey as we get closer to February. That said, we do have another summer training camp family holiday booked for Majorca in August, where I shall be reacquainting myself with the Sky-famous Sa Calobra climb. I’d quite like to have sufficient fitness to ride up that without suffering a Connery. 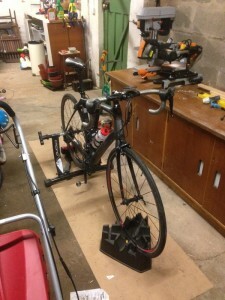 The all-improved Pain Cave. Complete with chop saw. So where will this cycling challenge (mainly) take place? 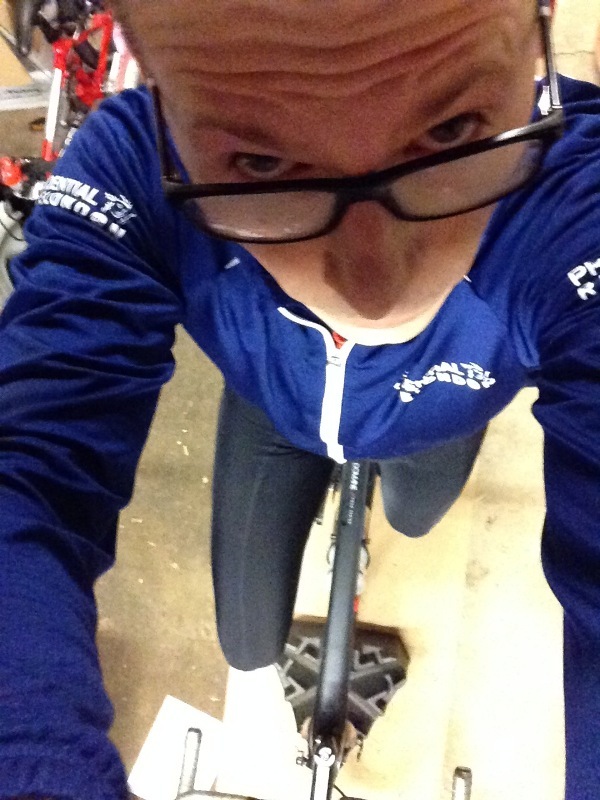 In my new, ‘all-improved’ pain cave. I fantasise that one day I will have my own climate-controlled cycling studio with all the toys. The sound system will blare out. The resistance on my indoor trainer will be controlled automatically by my iPad, mimicking the climbs of the Tour de France. I will spend hour upon winter hour in the zone. For now, however, I will be in my (slightly decrepit) garage. The only climate that is controlling conditions in there is the same one that deposits rain and wind upon the good people of Derbyshire. 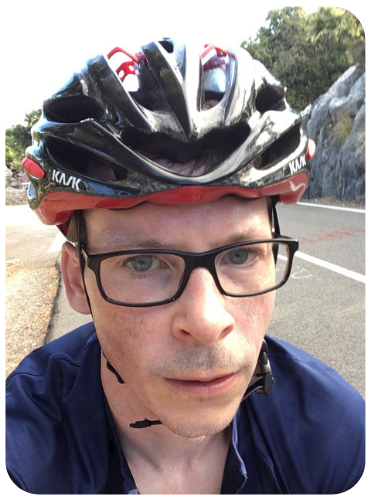 Decide how you’re going to keep track of your sessions (you could join me on Strava). Just 15 minutes ! That’s not even a warm up. Man up and do 35 minutes (bet you watch tv or surf the net for longer than that ). Get organised and you could surf net and watch tv from the pain cave while riding! Making double use of your time. Hi Ron(insteel) – I’m afraid I’m going to disagree forcefully. For what I’m hoping to achieve (re-establishing the habit of getting back on the bike), 15 mins is absolutely the right number. 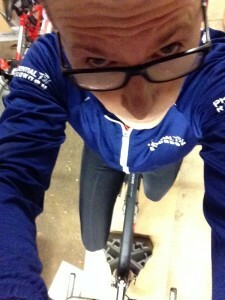 The key here is to dial in the habit of getting on the Lycra, filling the water bottle and going out into the garage, even if it’s cold, dark and I’m tired. As it happens, each time I’ve gone I’ve, so far, spent around 30 mins on the bike (once you’re there, it’s easy to add on a bit longer), but the key is to make the objective that allows you to continue the run of days ridden (a run which I now don’t want to break) almost too easy. Go, Monty! 15 minutes may be a good target, in that it’s kind of hard to pretend you can’t even find 15 minutes to ride. Start small and build on it; that’s what all the behavioral experts say. And I see from Strava that you’ve been riding more like 30 minutes each time, so possibly after 15 minutes you don’t feel like stopping. Ride on! Are you aware of https://www.kickstarter.com/projects/powerpod/powerpod-power-meter-for-cycling-fitness. Is it worth a gamble?? ?